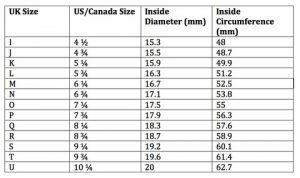 If you do not know the size that you require it is best to get your ring size taken at a jeweller, any high street jeweller can do this for you, this is the most accurate way and a chance for you to take a note of all your finger sizes for future reference too! These items are our “stock” pieces and so rather than stocking every size ring in every style we have chosen to use a more general sizing system similar to a lot of high street fashion jewellery stores. You can of course still order any of these styles to be made to a specific size by just popping a request for your desired size in the notes section in the online checkout. 1. Wrap a thin strip of paper around the base of your finger. 2.Mark the spot where the paper meets and measure in mm. 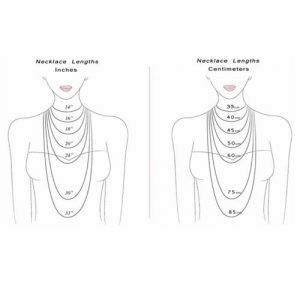 3.Use the chart below to determine the ring size from your measurements. Different countries use different methods of ring sizing below is a chart to convert the most commonly used sizing. 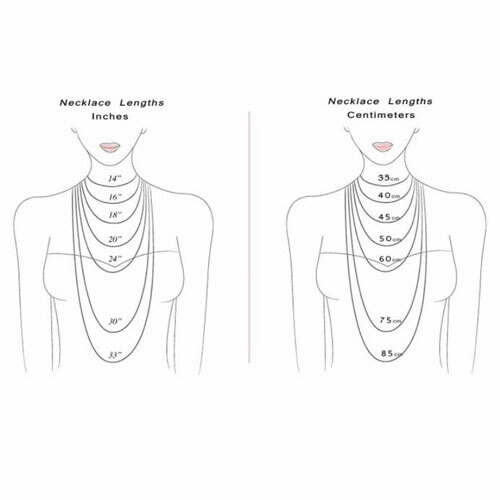 Many of our necklaces and pendants come in different lengths, below is a guide to show where these sit to help you to get the perfect length for you.